In 2006, 11,000 tonnes of construction/demolition waste was received at the Regional Landfill. 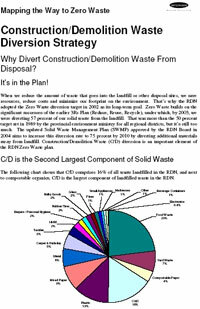 Please [ Click Here ] to download a copy of the Construction/Demolition Waste Strategy. 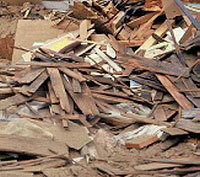 Construction/demolition waste (C/D) is wood and mixed waste from demolition and construction activities. It can contain many different types of materials including clean, treated and painted wood waste, plastics and vinyl, carpet, brick and rubble, glass, metal, and asphalt roofing. A 2004 waste composition study determined that after organics, C/D waste is the largest component of solid waste disposed of in the Regional Landfill. The RDN's Zero Waste Plan identified the need to divert the clean wood waste from construction demolition sites from the landfill. Arranging contracts with third party wood waste recycling facilities to manage wood waste received at the landfill and transfer station from small self-haulers. Effective January 1, 2008, the RDN banned clean wood waste from disposal in the Regional Landfill and roll-off containers of wood waste at RDN Solid Waste Facilities. Implementation of the wood waste ban and the Construction/Demolition Waste Diversion Strategy will advance the RDN towards its Zero Waste plan goal of diverting 75% of the region's waste from the landfill by 2010. The Construction/Demolition Waste Strategy and the disposal ban on clean wood waste has environmental, economic and social benefits. These measures will reduce greenhouse gas emissions resulting from the decomposition of organic wood waste in the landfill and generate economic activity and employment in the region by providing feedstock for licensed local wood waste recycling facilities.